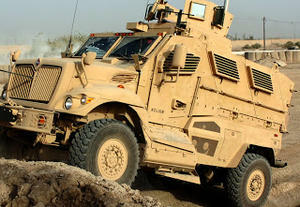 The Mine Resistant Ambush Protected (MRAP) vehicles were first deployed to the field in 2007 as a way to protect U.S. soldiers in Iraq and Afghanistan from ever-more-powerful improvised explosive devices (IEDs) used by insurgents. “[The vehicle] is used in the execution of high-risk warrants — including drug trafficking, smuggling, and contraband,” Ross Feinstein, a spokesman for DHS, told Business Insider. DHS posted a video to YouTube in which Robert Whittaker, tactical supervisor for El Paso SRT, displays the vehicle and explains its various features. There added skids for agents to ride along the sides, seating for 10-11 first responders, firing ports, and enhanced bullet protection for those riding inside.